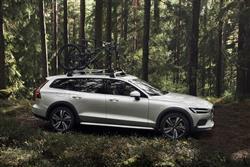 We already have a whole lot of time for Volvo's V60 estate, but giving it the Cross Country treatment can only broaden its appeal. Buyers get a 190hp 2.0-litre D4 diesel engine with eight-speed automatic transmission and permanent all-wheel drive as standard, plus an off-road driving mode. It's not cheap, though. Be honest with yourself. Do you really need an SUV? Chances are you don't. You might just be buying one because you like sitting up high, or you think you're going to come off better in a crash or maybe just because you think you ought to have one. Now, you're clearly within your rights to choose exactly whatever you've earned the money to afford, but buying an SUV comes with a whole bunch of downsides that their manufacturers don't want you to know about. The laws of physics being what they are, nothing comes for free. Added size is added weight, extra fuel thirst, compromised handling and less effective braking. If only there was a smarter way to get that rugged, go-anywhere look without all of the lard. You can see where I'm going with this can't you? Yep, Volvo delivers just that in the shape of this much improved second generation V60 Cross Country model, arguably a smarter solution than the average mid-sized premium-branded SUV. Volvo offers a single choice under the bonnet of this MK2 model V60 Cross Country, the 190PS D4 diesel engine being a fine unit. 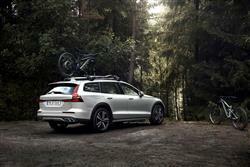 It also endows the Cross Country with a braked towing capacity of 2,000kg. 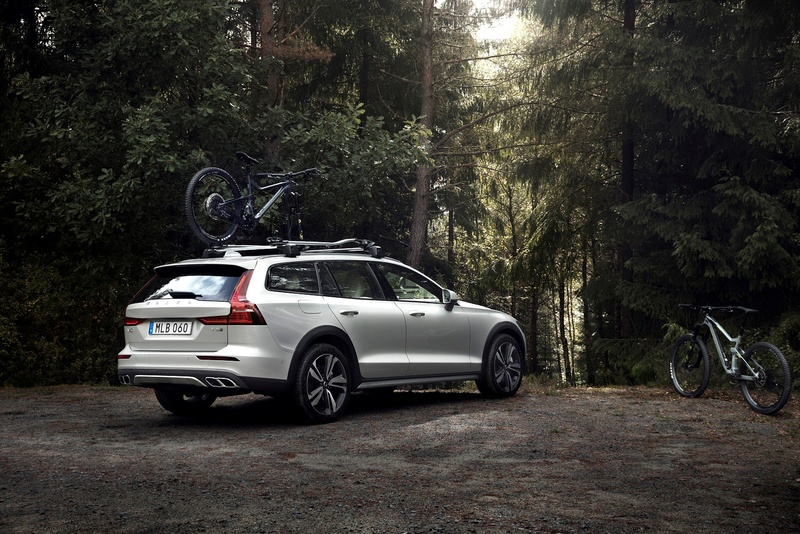 Permanent all-wheel drive comes as standard this time round, along with 60mm more ground clearance than you'd get in an ordinary V60. Plus this second generation V60 Cross Country also gets Hill Descent Control and an Off Road Drive Mode setting. So as you can tell, it's much more suitable for rough road treatment this time round. Hill Descent Control automatically controls the car's speed down a steep slope, while the Off Road setting alters the operation of the constantly variable all-wheel-drive system and the responsiveness of the engine, gearbox and accelerator pedal to help when negotiating tricky terrain below 25mph. 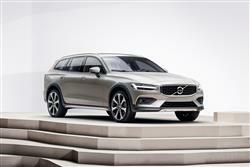 The previous V60 Cross Country couldn't really match the sharp handling reactions of its premium German rivals but buyers can expect a significant improvement in that area this time round thanks to the installation of the stiffer, more sophisticated 'SPA' 'Scalable Product Architecture' platform we've already seen used in the company's XC60, XC90, S90 and V90 models. As usual with Volvo models, there's a standard 'Drive Mode Settings' system, one of those set-ups now familiar in this segment that can tailor throttle response, steering feel and - if you've a self-shifter fitted - auto gearshift timings to suit the way you want to drive. 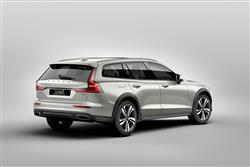 Plus there's the option of adding in Volvo's 'Pilot Assist' system. This is a set-up that at cruising speeds of up to 80mph can effectively drive for you. 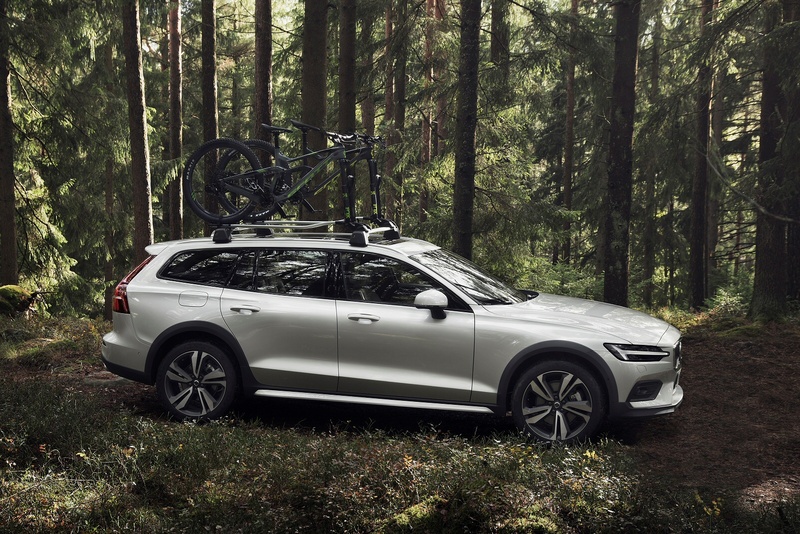 The base V60 was always a handsome car, but the Cross Country amps up the attitude a good few degrees with the addition of robust bodywork protection elements. Finished in charcoal grey, these include wheel arch extensions, lower sill mouldings and a rear bumper embossed with the Cross Country logo. With the lower grille adopting the same finish, extra visual ruggedness is added right around the lower part of the car, referencing its ability to tackle more challenging conditions. 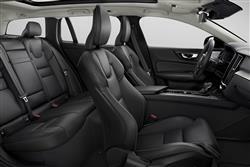 It also gets five-spoke 18-inch alloy wheels, which are specific to the Cross Country. 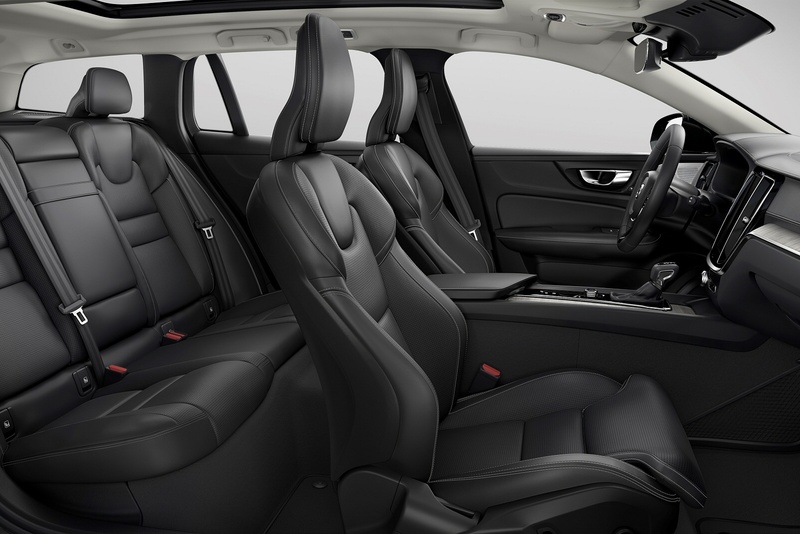 Inside, there's much borrowed from the brand's V90 and XC60 models, the interior boasting Volvo's latest, paired back interior design language with a 9.3-inch portrait orientated touchscreen infotainment system. Plus there's a digital instrument panel, with virtual dials separated by a customisable central space that can display a navigational map, trip computer info or your chosen phone or media settings. Out back, boot space comes in at 529-litres with the rear seats in place, outstripping rivals in this segment like the Audi A4 allroad, BMW 3 Series Touring xDrive and the Mercedes C-Class Estate 4MATIC. The rear bench splits 40/20/40 and drops down flat to the floor. It's a bit of a shame that Volvo hasn't been able to slot the entry-level V60 Cross Country under the £35k barrier, which is key figure for some company car choosers. The price for this model in D4 form is just over £38,000. Front and rear parking sensors, automatic LED headlights with Active High Beam, a powered tailgate and Hill Start Assist come included. Optimum temperature and air quality is maintained by the dual-zone climate control with CleanZone system, also fitted as standard. A range of accessories - including ski, kayak and bike holders - are available for those with adventurous lifestyles. You also get some lovely tech like the City Safety function with automatic emergency braking, which is capable of detecting and helping you avoid potential collisions with pedestrians, cyclists and large animals as well as other vehicles on the road ahead. 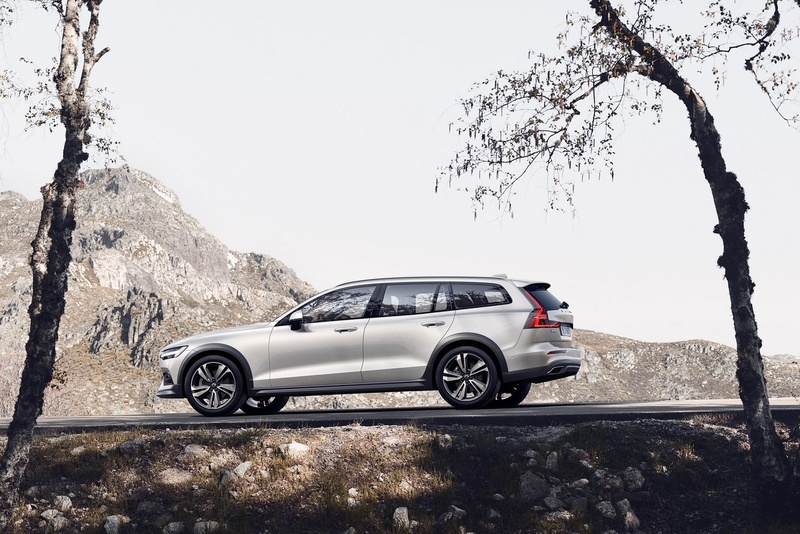 The V60 also benefits from Oncoming Collision Mitigation, a world-first safety technology that detects vehicles travelling towards you and applies the brakes automatically to limit the severity of any potential impact. The purchase options are innovative too. In certain areas of the country, customers who want an alternative to outright purchase, leasing, contract hire or finance schemes will be offered the opportunity to acquire a V60 using the new 'Care by Volvo' scheme. Here, there's no deposit required and you'll get a two year agreement that also includes use of another Volvo model for up to two weeks a year. 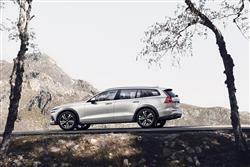 Volvo's 'Drive-E' technology means that fuel returns and CO2 emissions are well up to class standard. Using the standard 18-inch wheels, the benchmark efficiency figures are 55.4mpg combined cycle fuel economy, with CO2 emissions of 135g/km. 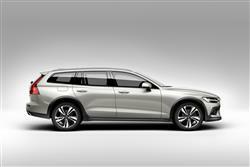 Demand for the XC60 SUV has proved that buyers in this class like the rugged Volvo look, and the V60 Cross Country has a more cerebral appeal that ought to plump up residual values quite nicely. Ultimately of course, we can talk about figures all day but the ultimate cleanliness and frugality of any car has as much to do with the driver as with the automotive engineer. Here, the figures quoted assume that the car is being operated in the most frugally-orientated of the available drive modes - 'Eco' - a setting that gives you a green-tinged gauge you can use to regulate throttle application. Maintenance should also be relatively affordable for a car of this kind, with intervals every year or 18,000 miles. Three or five year pre-paid servicing packages are available to help you budget ahead. 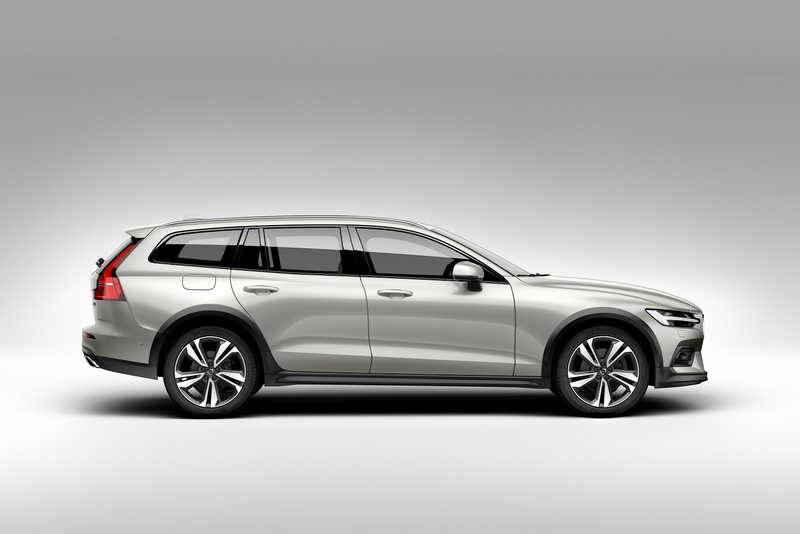 With the useful 'Volvo On Call App' remote connectivity system, this V60 can be programmed to autonomously realise when a service is due, then automatically book it for you at a dealership of your choice. Finally, we'll tell you that the warranty is the usual three year, 60,000 mile package. 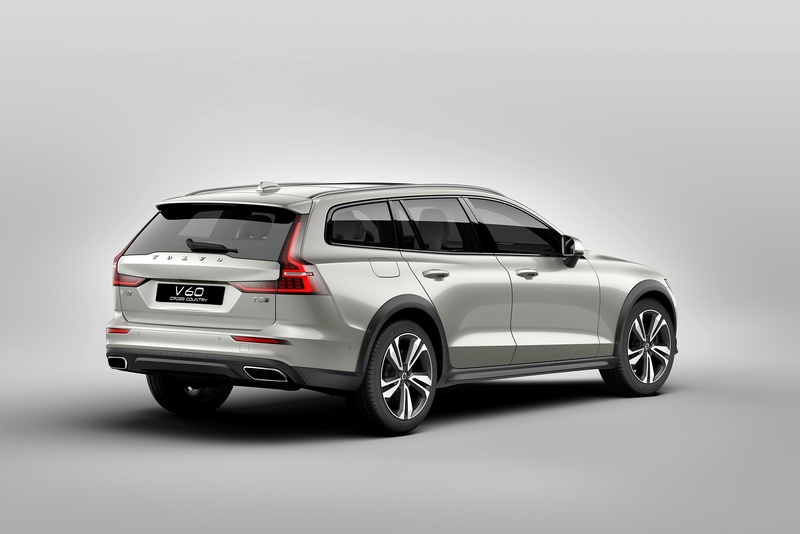 If you�re looking for a new Volvo V60 2.0 D4  Cross Country 5dr AWD Auto Diesel Estate for sale, you�ve come to the right place. 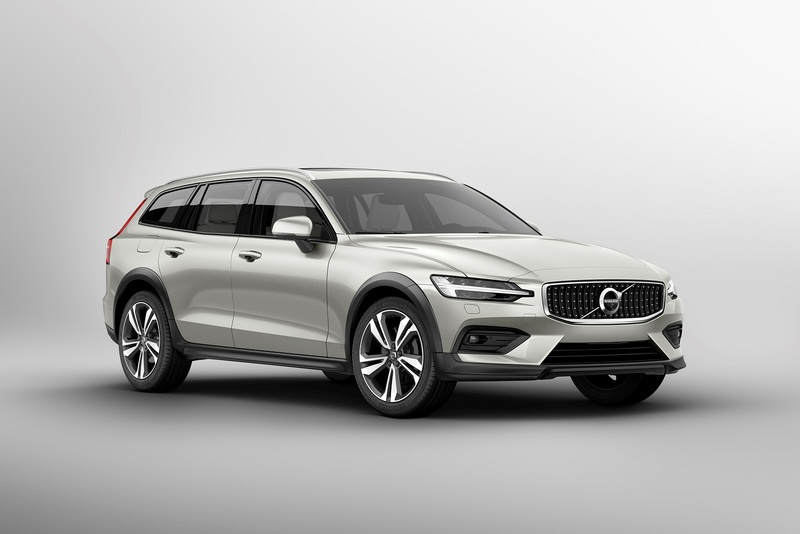 At Bristol Street Motors we don�t just have the best Volvo V60 2.0 D4  Cross Country 5dr AWD Auto Diesel Estate deals, we also offer friendly advice and help with all your enquiries to ensure your buying experience is a happy experience.